As many of you know, 2017 brought a huge loss to Any Soldier Inc. Marty Horn, Founder and President of Any Soldier Inc., passed away in February 2017 after a long battle with Progressive Supranuclear Palsy. Marty dedicated his life to the sustainment of Any Soldier Inc., no matter how hard the economy hit us. Our service members and their support from people from all over the world were his first priority. He made it very clear to the Horn family that the continued success of Any Soldier Inc. and its support was his wish. The Horn Family continues to strive to make this happen. With this in mind, we pray that Any Soldier supporters will once again join together and try to reach our goal fundraising goal in Marty's memory. This is our 7th annual Donations for Appreciation in Memory of Marty Horn fundraiser. We are trying to reach our goal of $50,000 by Independence Day 2018. We cannot reach our goal without all of YOU and we ask all of our supporters and Support Junkies to help Any Soldier Inc. once again. This fundraiser helps us every year cover the declining donations due to the economy and for the survival of our organization. You may make a donation by going to the "Donations" page and telling all your friends and family or you can become a personal fundraising participant. We invite you to show your appreciation to the men and women of our military services through this great fundraiser. It's easy to become a fundraising participant. Just go to the "Be a Participant" page, set your fundraising goal and tell all your friends and family. Sign up as an individual, company, team, school or any other group with your own fundraising goals and help support our troops. Supporters can donate directly on your personal page and you can watch your goal become a reality! The top three fundraisers that raise $2500 or more will receive an official Certificate of Appreciation from Any Soldier Inc. and recognition through our website to all our servicemen and women and supporters. Sign up now! 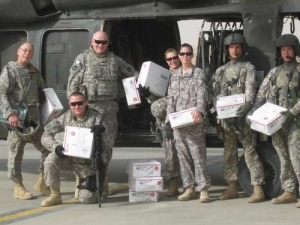 Minnesota Unit poses with received AnySoldier packages October 2009, Afghanistan.